Valentine’s Day Gift from MV Salon. 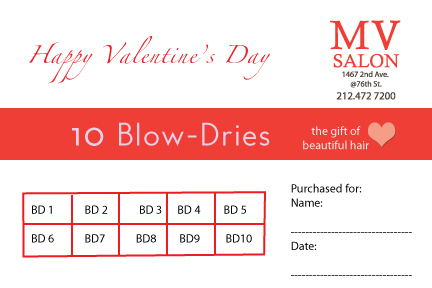 Gift card of 10 Blow-dries for $289 instead of $350. Happy Valentine’s Day. And if you don’t have a Valentine this year, remember self love is the greatest love of all! Print this card and bring to the salon to activate.